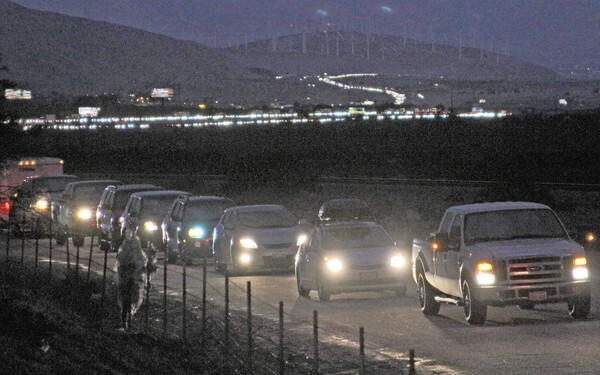 The 25 mile debacle by Caltrans along I-10 between LA and Palm Springs, Feb. 12, 2012. If you live in San Diego, you probably were not aware of the huge traffic mess up in the Los Angeles area last weekend along the I-10 freeway between LA and Palm Springs. It was huge, horrible, horrendous, and people had to wait many, many hours before there was any relief along the 25-mile-long traffic jam. 25 miles! Some life-long residents of LA called it the “worst” they’d ever seen. The LA Times analysis laid the blame for the mess squarely on Caltrans, calling it scandalous. But the explanations and repeated apologies from road officials did little to calm the anger of thousands of motorists who had to wait. Several area politicians have demanded investigations, and Caltrans has transferred the engineer who oversaw the project. The traffic was so bad that many drivers had no choice but to urinate on the side of the freeway or in bottles. Some people missed flights and important appointments. Apologies are all fine and dandy, but don’t mean much from such a powerful, bureaucracy like Caltrans. Caltrans, the state’s department of transportation, is a huge, unresponsive, unaccountable bureaucracy with a singular purpose: build more roads and freeways. It has enormous coffers of tax dollars to use, it employs thousands of our fellow Californians, and the impacts of the decisions by its management on communities are significant. There are examples all around just in the San Diego area. Communities such as Barrio Logan, Little Italy, and City Heights have all felt the pain of freeways cutting up their neighborhoods and forcing residents to move out. Yet, finding out about the fiasco on the I-10 last weekend ignited some of my worst thoughts about Caltrans. 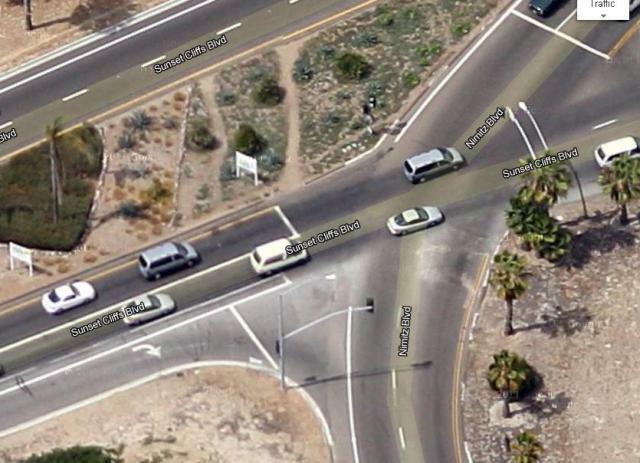 And it set me to figure out what are some other examples of where Caltrans’ management really screwed up in our area. It was not difficult and I have listed them below. And just for the record, I am not an engineer but I am a consumer, a driver, a layperson, but I also have a brain and a memory. Leaving OB on Sunset Cliffs Blvd. Only 1 lane to I-8. There is only one lane for motorists leaving Ocean Beach and getting on I-8 East from Sunset Cliffs Boulevard, the main north-south avenue into and out of OB. There used to be 2 lanes – and yes, they did have to converge as you drove onto I-8. But with the elimination of one of those, there are now just not sufficient lanes. There is a one lane for turning onto Nimitz Boulevard but hardly anyone takes it. There are two lanes that are available if you want to go north across the bridge over the San Diego River and head toward SeaWorld. Hmmm. Is there a connection there? I know of at least one accident that occurred in the lane that is destined for the freeway, an accident of 4 vehicles – that I firmly believe would not have happened if there had been two lanes for the waiting vehicles. So, only one lane gets you onto one of the largest freeways in Southern California, but there are two lanes if you want to go to SeaWorld. No. 2. Caltrans’ Screw-up: Only 1 Lane for transition from 5 North to 8 East. This is really a no-brainer, but there’s always backed up traffic on 5 North waiting to make the transition onto 8 East, as there is only one lane. 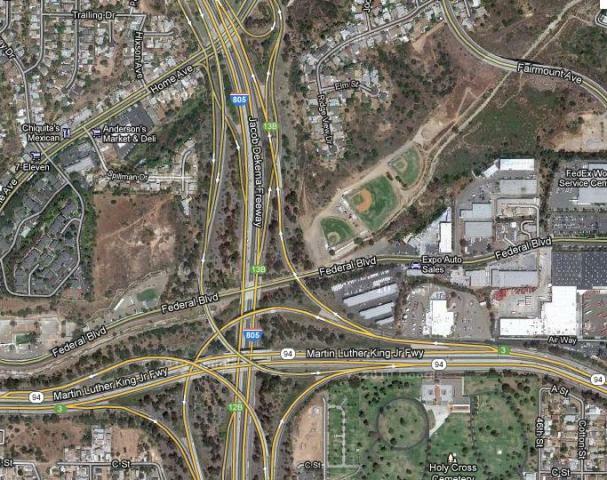 These are two of the most important and major freeways in this part of the world, the 5 and the 8. But there is only one lane between them if you are going north on 5. This causes crashes, rear-enders and a lot of anxiety among drivers trying to make the change. There are two lanes – thankfully- that get you into OB and the beach area. Only 1 ramp from 5 North to 8 East. Not Mentioned: I’m not even mentioning the other OB screw-up by Caltrans: there’s no freeway transition from 5 South to 8 West, and its reverse, there’s no transition from 8 West to 5 North. I’m not listing these as some in Ocean Beach actually like this arrangement because it makes them feel a little more “isolated” from the world – part of that OB incubation sense. Also Not Mentioned: Also not on the list are the awful exits from 5 North and 5 South in the La Jolla to Del Mar area because Caltrans has already addressed these problems by obtaining more money to build more lanes. This is one of the classic screw-ups by Caltrans in our region. When the 805 was built and when the 15 was built years later, there was not adequate transition ramps and roads developed going south where they meet 94. Everyday, there are hundreds of vehicles waiting, waiting to get off the 805 South and get on the 94 East – which is the real problem. Of course, it’s worst during rush-hours, but even when there is no clock ticking to get people to drive faster, there are problems here. My own personal way to deal with this mess, is to take the 15 South and get on 94 West, then turn around at either the 30th or 25th Street exits to get on 94 East. Those of us who drive the 94 are aware of this debacle: there is no freeway transition if you are driving south on the 125 and want to go on 94 East. Drivers must completely exit the 125, and go through a long light before they are able to get back on a freeway to travel east on 94. This not only messes up their ride, but also places burdens on the local neighborhood where all this occurs. If you’re coming off the 94 East, you suddenly run into two lanes of waiting cars that just left the 125 South, and you cannot even make your turn, and have to go a completely different way. Motorists must completely leave 125 South, go through a light, and then get on 94 East. 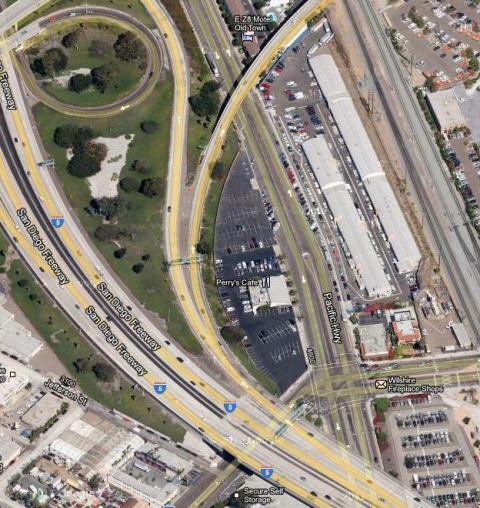 One of the worst places in San Diego County is the convergence of 125 South and 8 West, where including HOV lanes and the lanes coming from Grossmont Boulevard, there are multiple lanes – like up to 8 lanes – coming together in just a short physical space and length of concrete to actually merge to only 3 lanes. You almost have to experience this daily mess to understand it. But if you are leaving 8 West to get on the 125 South, you take that new, high bridge and it brings you down to where the Spring Street exit comes right up, so you’re running into vehicles slowing down for that exit, while trying to maneuver around the vehicles coming up from Grossmont, with those already on 125 South. There was a deadly crash in December that took the lives of 2 unfortunates who were trapped in the mess. Everyday there are screeches and the smell of brakes – and really needs immediate attention from safety experts and conscious-engineers. 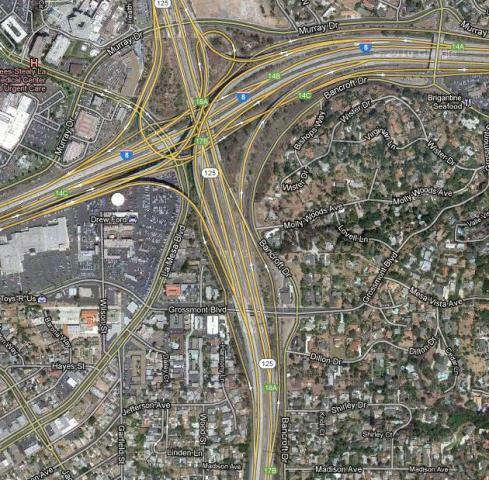 The deadly stretch: 125 South, 8 West, Grossmont Blvd., all converge. There is no transition from 5 North to 94 East. Okay – you’ve now seen my Caltrans screw-ups. What and where are yours? Give us a holler, take a picture, let us know. You know of at least one accident getting on I-8 coming out of OB? Heck, I’ve only been here five years and I’ve witnessed four, plus at least two near misses a week when idiots intentionally use the left lane to avoid traffic on the right and then dive across the intersection at the last second to cut off people waiting in line. I’m talking to you, jerk with the black Nissan Titan big dumb truck all prettied up with glass fenders, dual reservoir suspension, and giant mudders that you’ve never taken off road unless you count nearly clipping the median as you attempt to cause a wreck every single one of the several dozen times I’ve seen you in the morning. I call those selfish bastards who won’t wait their turn and dive in at the end “last minute Larrys” and the result of their actions is usually so disruptive it actually is the cause of the backup on medium traffic days. Nothing remotely compares with not building bridges with the widening of the 52. Goes back and forth between 3 and 2 lanes. What a nightmare. With gas going to 5 dollars a gallon people try to make over the hill on fumes and run out every single day. Nice writeup and supporting graphics – definitely a good read. I would suggest, however, that a couple of your items aren’t really “screwups” so much as artifacts of decades-old planning that was rational at the time. Keep in mind that most of I-5 and I-8 were built in the 1960s, when San Diego was MUCH smaller and rates of car ownership were much lower. As a parallel example, I learned in school that the planners who designed LA’s freeway system had no idea that car ownership (as well as the population of the city itself) would explode like it did. Even the most visionary planners at that time just couldn’t fathom what we have today. (And even if some had anticipated it, building highways in sizes that massively exceeded current demand wouldn’t have been viewed as cost-effective anyway.) Both items No. 1 and No. 2 are representative of that anachronism. On No. 1: The drive out of OB to I-8 is definitely frustrating, but with only one freeway lane to enter, that 2-to-1 merge has to go somewhere. I’m no engineer either, but in safety terms it seems intuitively like the lesser of two evils is to force this merge on the secondary roads that lead up to the highway (where speeds are lower) rather than forcing people to merge in the entrance to the freeway (when cars are accelerating rapidly). But I don’t know. You also point out that “only one lane gets you onto one of the largest freeways in Southern California, but there are two lanes if you want to go to SeaWorld.” But that’s not really a fair complaint, because as you note in item No. 2, those lanes to SeaWorld are also the only access route for I-5 North! I do agree with you that there should be a direct ramp from I-8 East to I-5 North – but until such a ramp exists, you have to accept the fact that the left lane is a necessary access route for I-5 North, and thus much more important that you are portraying it to be. On No. 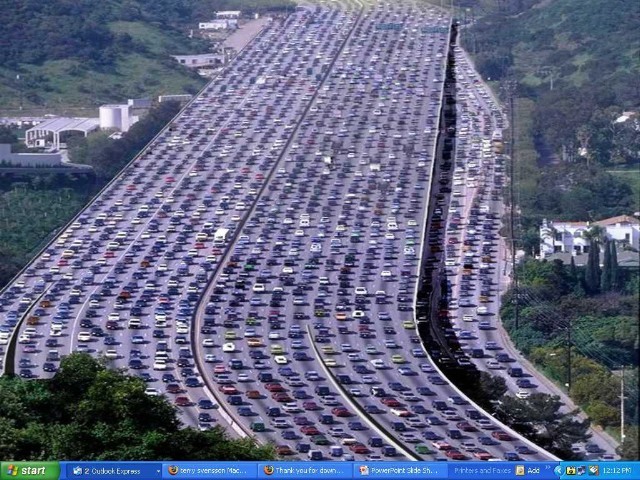 2: You’re definitely right that the backup going from I-5 North to I-8 East is terrible every day. But again, I wouldn’t call this a “screwup.” When Caltrans designed the freeways in the 1960s, Mission Valley wasn’t developed like it is now – not even close. Two lanes to OB and one lane to Mission Valley made sense then, given the development patterns of the time. Fast-forward 40 years, and today Mission Valley contains tens of thousands of housing units and countless shopping centers – that’s where all the congestion is coming from. Should Caltrans expand that ramp now to meet the new demand? Probably… but you have to consider the tradeoffs required. Given the high cost of transportation projects (especially for this one, which features an above-grade ramp that bisects an environmentally sensitive wetland and a state-designated historic area), you would need to weigh the cost-benefit of this project against the cost-benefit of many other potential highway projects in the region. But whether or not a fix makes sense today, you are still correct that the congestion at this location is maddening. Thanks again for the interesting writeup. Hey you sound like an intelligent person who has deep knowledge of these issues. Not only does the exit lane slow down, but the far-right lane also slows down because of morons trying to show off in their new BMW and cut in front of everyone else waiting. This in turn causes the rest of the freeway to slow down (if you’re not getting off the freeway, WHY are you slowing down?) and causes massive gridlock everyday from Grand/Garnet up to La Jolla Village Drive. At some point during every commute, I think about how there needs to be a huge class-action lawsuit against caltrans for taking our tax money and building an antiquated, dangerous inefficient and completely inadequate highway system. Then I realize that would be like suing ourselves. But can they at least answer for the incredibly dumb stuff? Why are there ramps with negative banks? EB52 to SB805 is a good example; just as you hit the apex of the curve and start up the hill, the ramp’s bank suddenly goes to the inside! And please, please, please is it really all that difficult to make the arrow on the sign line up with the lane? Or maybe to put up signs to let drivers know what lane they need to be in BEFORE they get to the transition? Perhaps Caltrans should require the traffic engineers they hire to have a driver’s license that didn’t expire in 1932.; the system we have now seems to have been created by people who not only do not drive, but may have never actually seen an automobile. Looks like I made a typo on my last comment – the connector project that Caltrans is already working on is between SR-94 and SR-125 (item No. 4 in this article). As an update, the recently adopted Regional Transportation Plan shows this project being completed by 2020. In addition, I believe the connection between I-805 and SR-94 (item No. 3 in this article) is also scheduled for improvement by 2020. See Chapter 6, Table 6.3 of the RTP (available at http://bit.ly/xRBLni). Here’s a dangerous one you missed: On the transition from 94W to I-5N you’ve got two lanes travelling downhill at a high rate of speed. On the right is a merge in from an on ramp in the Golden Hill area that just came from a dead stop and if you’re getting on there you can’t see if the lane’s clear to merge and little time to get up to speed and mesh. Driving on the transition you don’t really see the danger, try it from the on ramp and you’ll see what I mean. Yup, you’re right, John, and this is a good nomination for #6. 15 North to 94 West is pretty dangerous. The interchange loops around, but the length is too short to gain sufficient speed to match the traffic flying down 94. And you get dumped right into the slow lane with no gradual merge. Even in my BMW I have trouble accelerating fast enough. Another place they screwed up was only putting 2 lanes westbound on the 56 freeway. They could of added some extra space on the bridges for an additional future lane but nope! It’s hard to believe people go to college for city planning and still screw up this bad. East County resident here. 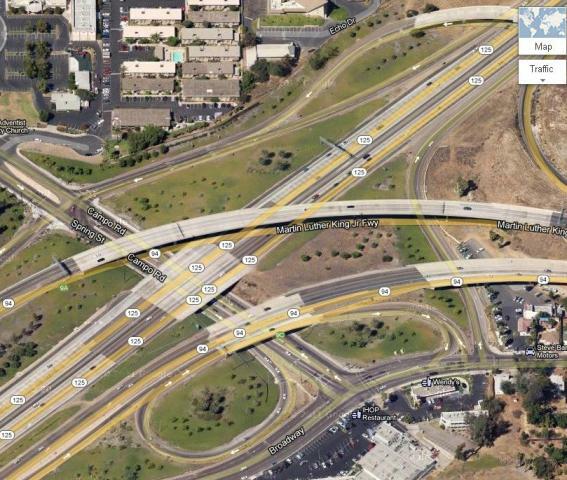 No one mentioned the I-8/SR-67 connector. There is only one lane that goes from I-8 West to SR-67 north, not to mention that traffic from Mollison Ave. to I-8 uses the exact same lane. Also, from SR-67 South to I-8 East there is only one lane, and you have to weave into a few other lanes or else you end up on Magnolia Ave. It’s a corridor that is not being addressed on, no plans to improve it whatsoever. If this post is ever re-written, I’d include the mess of the 8 and 125 connectors and perhaps that 67 and 8 connection; thanks for your input.